As anticipated, on March 6, the Bank of Canada (“BoC”) opted to maintain its benchmark interest rate at 1.75%. In its policy statement, Governor Stephen Poloz highlighted concerns regarding the global economy and the uncertainty of future rate hikes. Major concerns included lower crude oil prices and a decline in investments in the housing market. In addition, RBC highlighted that the economy slowed more than the BoC expected as GDP growth for Q4 of 2018 came in at 0.4%, the slowest rate of growth in two and a half years. National highlighted the stabilization of the trade-weighted USD in February but noted it will be temporary given the more cautious Federal Reserve. RBC noted that the U.S. recorded growth of 2.6% in the last quarter of 2018 due to solid consumer spending and business investment. TD expects the USD to slightly depreciate against other major currencies as they begin to gain some ground over the next two years. Overall, the surveyed banks lack consensus as to the future of the pair, forecasting the currency pair to trade between 73.5 and 81.0 US¢/CAD through Q4 of 2020. On March 7, a day after the BoC’s monetary policy announcement, the European Central Bank (“ECB”) downgraded its outlook for Europe’s economy, with ECB President Mario Draghi highlighting that interest rates will not be adjusted until at least 2020. Also mentioned was the lowering of GDP growth forecasts and the new series of quarterly targeted longer-term refinancing operations (“TLTRO-III”) starting in September 2019 and ending in March 2021 as a measure to boost bank lending. Scotiabank noted that the observed slowdown was a real “game-changer” in terms of the monetary policy announcement for the ECB and adjusted its forecast accordingly. RBC highlighted that the slowdown in the Eurozone caused the reporting bank to lower GDP forecast for 2019 from 1.7% to 1.1%, further hinting that inflation will now take longer to reach its target of 2%. National highlighted that fears around Brexit and a potential U.S. – E.U. trade war have added risks that will weigh on the Euro during 2019. Overall, the surveyed banks are forecasting the EUR to trade between 59.2 and 65.4 EUR¢/CAD through Q4 of 2020. The BoC announced that it will maintain the Canadian overnight rate at 1.75%. National changed its forecast to forecast one rate hike in Q4, calling for the BoC to pause longer than expected before resuming policy normalization. TD believes that the current rate of 1.75% “is as good as it gets” and is forecasting that there will be no additional rate hikes for 2019. The next scheduled date for announcing the overnight rate target is April 24, 2019. In the U.S., the Federal Reserve maintained its key interest rate unchanged and scaled back their projected interest rate hikes to zero in 2019. The pause is in response, in part, to slowdowns in the U.S., lower energy prices which are weighing on inflation, and risks from global economies. Economic growth is now expected to be just 2.1 per cent in 2019, down from prior projection of 2.3 per cent growth. 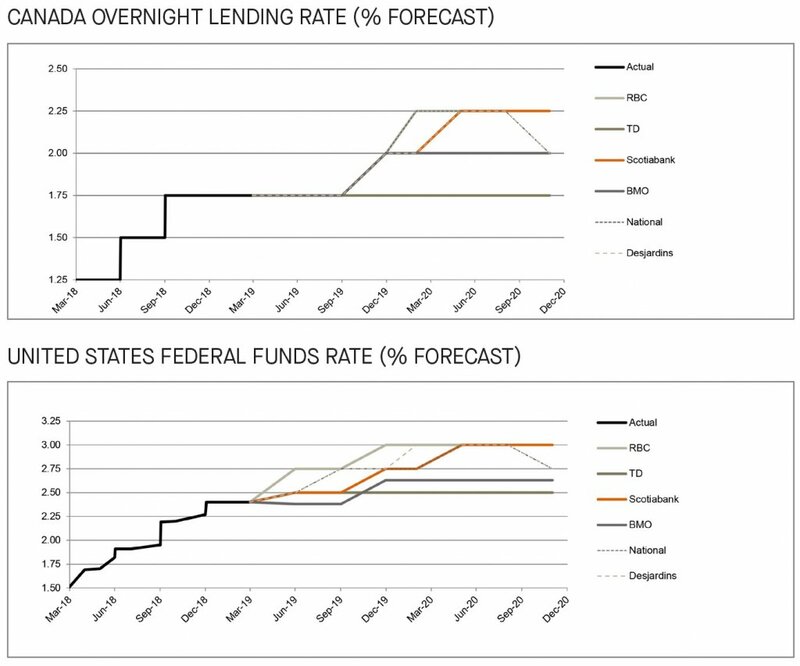 Prior to the announcement, the surveyed banks were in consensus, with the exception of TD, that the Fed will hike at least once in the second half of 2019. 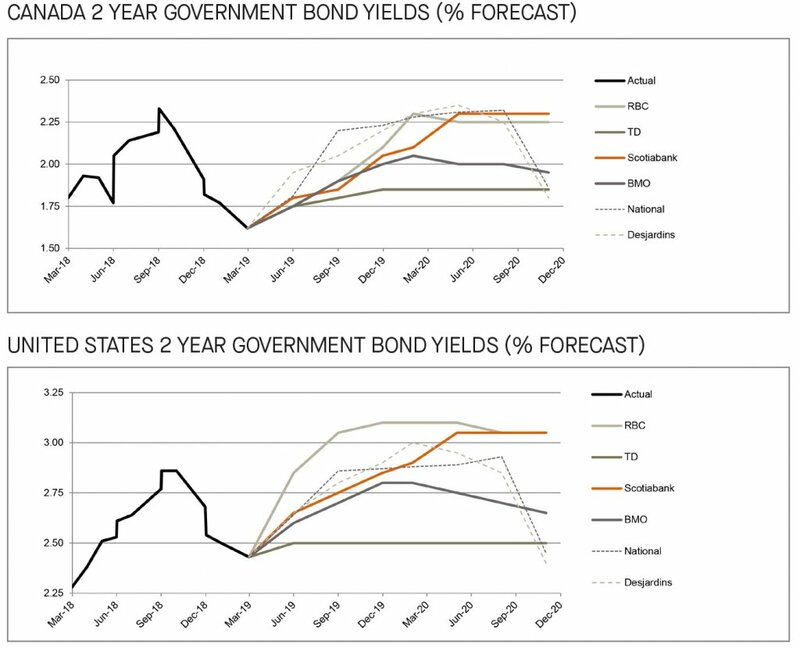 This month, the reporting banks all lowered their forecasts for Canadian and U.S. 2-year government bond yields. The biggest adjustment came from Scotiabank who downwardly adjusted its 2019 Q4 forecast by 60 bps and 45 bps for Canadian and U.S. short-term bonds, respectively. The surveyed banks are still in consensus for a slight but steady rise in the yields with an average forecast of 2.1% for Canadian and 2.8% for the U.S. 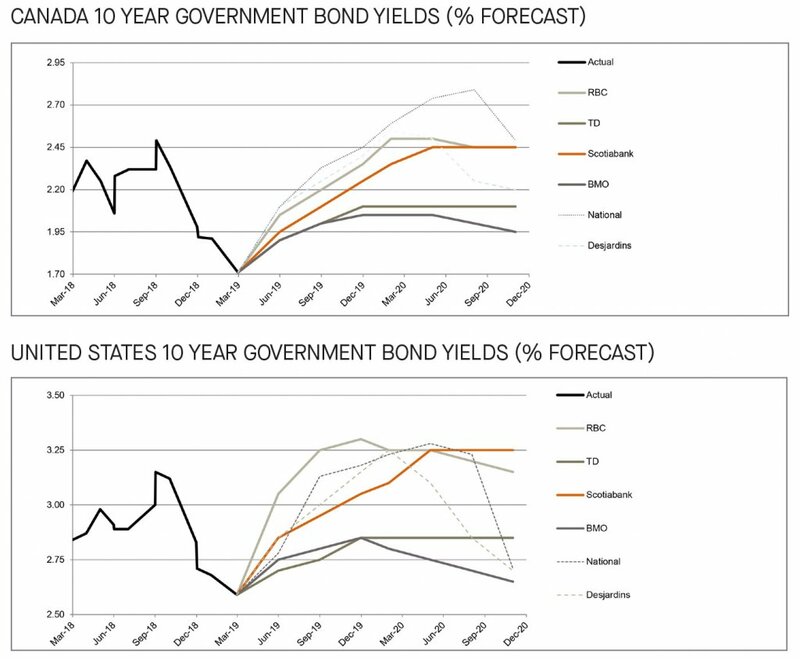 The surveyed banks have continued to downwardly adjust their forecasts for both Canadian and U.S. 10-year government bonds yields from last month’s publication. Despite this, the banks are still expecting to see the Canadian and U.S. yields to continue in an upwards trend, albeit at a slower pace. 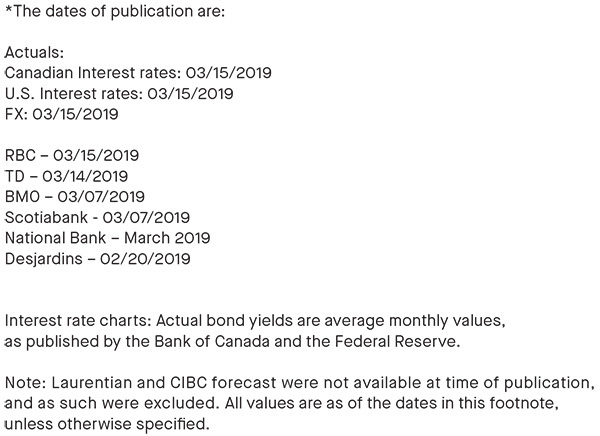 For Canadian 10-year bond yields, the 2019 year-end rate forecasted by the surveyed banks range from 2.1% to 2.5% compared to last month’s ranges of 2.1% to 2.8%. TD has attributed its downward shift to deteriorating global growth forecasts, including Canadian growth forecasts. 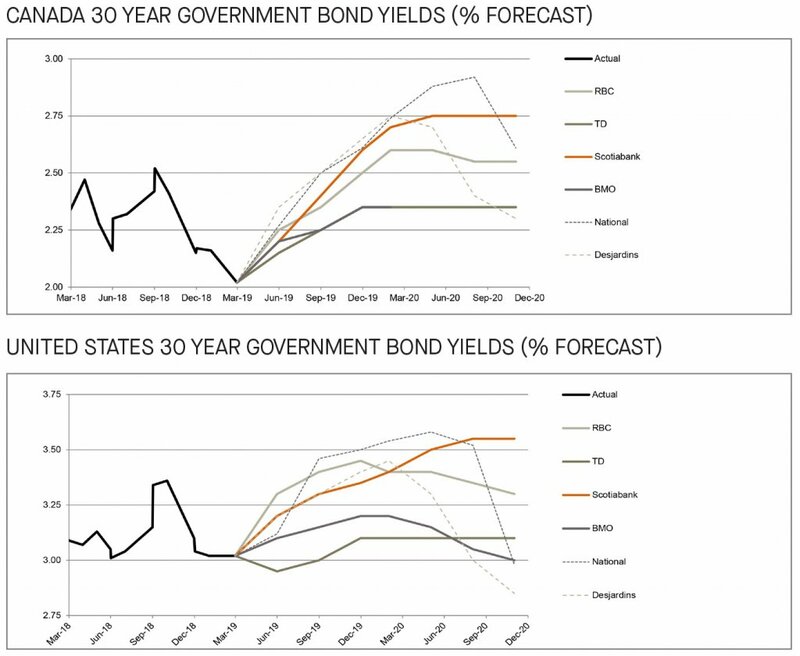 For U.S. 10-year government bond yields, the surveyed banks’ forecasts range from 2.9% to 3.3% compared to last month’s range of 2.9% to 3.4%, with the banks generally citing heightened economic uncertainty as the reason for the decline in forecasted yields. Consistent with the adjustments in shorter-term bond yields, forecasts of long-term bond yields in the U.S. and Canada were similarly lowered. Last month, Scotiabank was expecting the Canadian long-bond yield to peak at 2.9%, which it has now reduced to 2.6%. Similarly, in U.S. long-bonds, National reduced the peak of its forecast from 3.7% to 3.5%. BMO believes that America’s much worse fiscal position and Canada’s poorer economic competitiveness will lead the U.S. and Canada’s long-term yield spread to become less negative as the year unfolds.